I am beginning to take an interest in French food. It was cold outside today so wanted something hearty and warming. I found a lovely recipe for rabbit in mustard sauce but on visiting the butcher was disappointed to discover that they’d all gone, so instead I bought some good quality grain fed chicken supremes instead. I modified the original recipe to include brandy instead of white wine and the end result was magnificent. 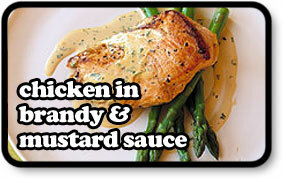 The sauce has a hint of sweetness but enough depth to satisfy the palette. It was really rather good! Season each chicken breast on both sides with salt & pepper and set aside. Heat a large flame-proof casserole pan on the stove with the olive oil. Place the 4 chicken breasts, skin side down for 4 minutes until browned turn over and cook for a further 4 minutes. Remove from the pan. Add the onions and pancetta to the pan and saute for 5 minutes. Sprinkle over the flour and thyme and stir well. Pour in the brandy, let sizzle briefly then pour over the chicken stock. Stir well and bring to a simmer. Return the chicken to the pan, skin side up and cover with a little sauce. Put on the lid and place in oven. Cook for 1 1/2 hours. Remove from the oven, gently take out the chicken. Stir in the cream and mustard and adjust the salt & pepper if you see fit. Return the chicken and you’re done! Serve with some creamy mashed potato and vegetables. Make sure you have plenty of bread to soak up the delicious sauce!